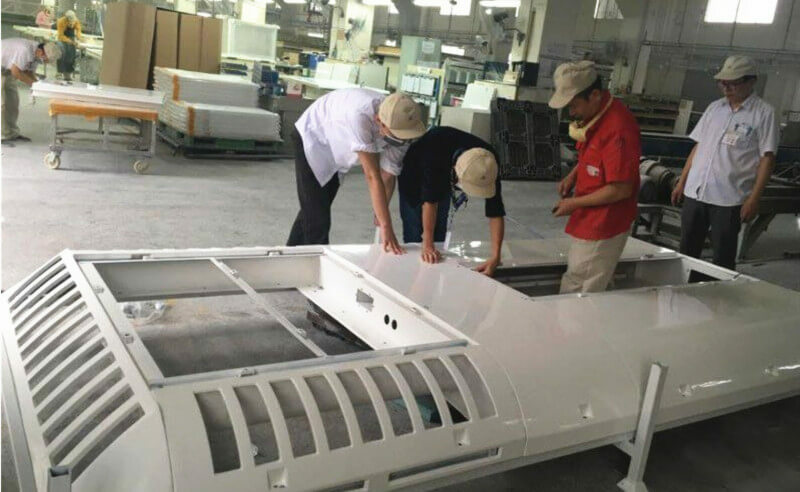 The FRP weight of new energy vehicle’s fiberglass shell and air conditioning cover is over 40% lighter than the traditional products which often use metal as raw material. Using fiberglass shell can reduce consumption of energy and at the same time, increase the weight which the vehicle can carry. The fiberglass yield strength and FRP tensile strength of FRP cover are pretty good, they are three times of the strength of plastic products. The FRP shell has good impact resistance, therefore it’s safer for people who are in the FRP new energy vehicles. What’s more, if there is anything that’s broken happened after the vehicle is put into use, it’s pretty convenient for us to repair and the cost of repair is really low. 3.Good performance of corrosion resistance. There are many good fibre reinforced plastic properties of fiberglass shell, one of which is its good performance of corrosion resistance. The FRP shell is resistant to rust, aging resistant and has long service life. It can reduce the workload of maintaining and preserving the new energy vehicle’s fiberglass shell and air conditioning cover. 4.Great glass fibre reinforced plastic properties of thermal insulation. We use a kind of sandwich material with low thermal conductivity on the fiberglass shell of new energy vehicle. So, one of the fibreglass material properties, heat insulation effect, uses to be really great, and the failure rate of new energy vehicle turns out to be low. The FRP shell of new energy vehicle has a quite beautiful appearance, fluent modeling and smooth surface. We can produce such a big size of vehicle shell by using the whole shaped technology to satisfy the demand of clients. 1.Fiberglass shell of new energy vehicle. 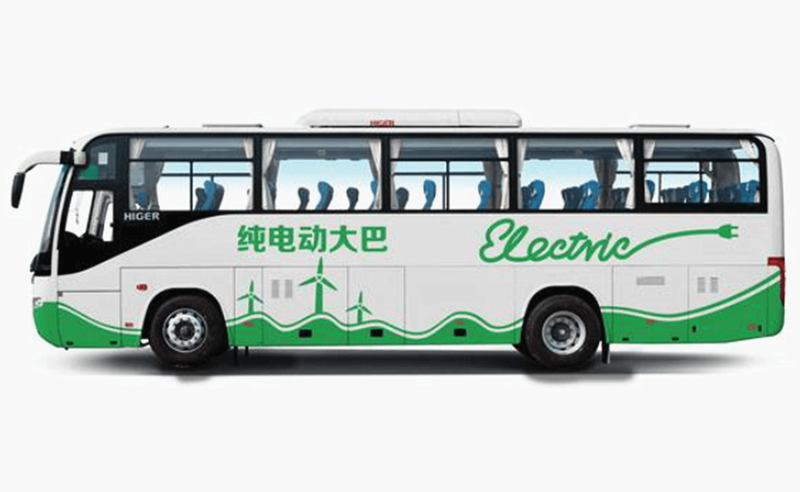 Fiberglass shell can replace the metal shell of a conventional bus to reduce the self weight of new energy vehicle. 2.FRP cover of bus air conditioning. FRP cover can replace the metal cover of conventional car air conditioning to further reduce the weight of vehicle accessory. 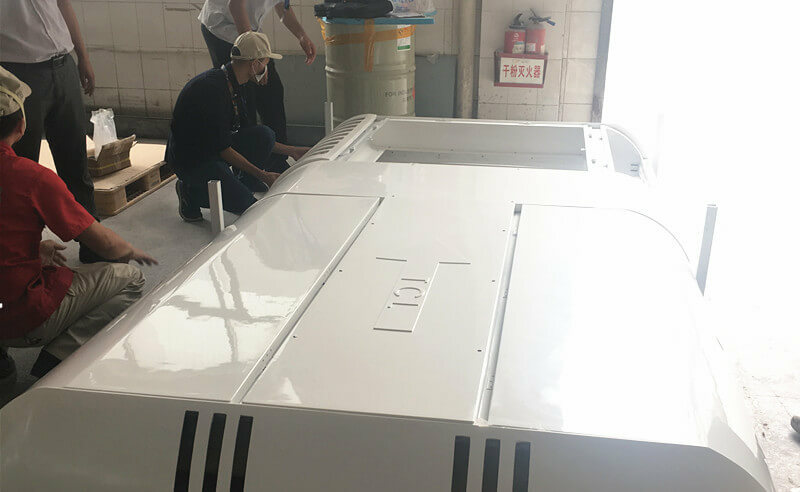 Hand in hand with domestic famous brand air conditioner manufacturers, Dongguan MIYABI-FRP Limited has successfully developed FRP cover for bus air conditioning. Using FRP material to manufacture air conditioning cover has many advantages of FRP. As we all know, fiberglass reinforced plastic material has good anti-aging ability, and great performance of anti-corrosion. According to the conservative estimation of FRP experts, the life of GRP cover that uses unsaturated polyester resin as matrix can reach to 10-15 years. However, the research and development phase of the project can be said to be a bumpy ride. The size of FRP covers is large, and their structural shapes are designed in reference to hardware molding process. Therefore, there are many holes and the structure of bus air conditioning cover is pretty complex. In the early stages of research and development, we don’t strictly make gauge and jig to reduce the FRP cost of development. Unfortunately, a lot of details and problems occurred on the GRP cover of bus air conditioning. There are crack, deformation, hole deviation, bubble and the shrinkage rate is too large. Our improvment for FRP cover. When these problems happened, the R&D team actively communicates with our customers. On the basis of the actual assembly of customers, we have improved the FRP product in many ways until we satisfied them. For example, the R&D team decided to repair the product manually and modify the FRP molding. What’s more, they take corresponding improvement measures to various problems to ensure that no similar problems occur during mass production of fiberglass cover. At present, the project is about to enter the stage of fiber glass production, and we have confidence in the smooth progress of this project. Obviously, FRP covers manufacturers can also provide other FRP products. Such as radome cover, FRP wall covering, FRP manhole cover, etc. Fiberglass shell of new energy vehicle.